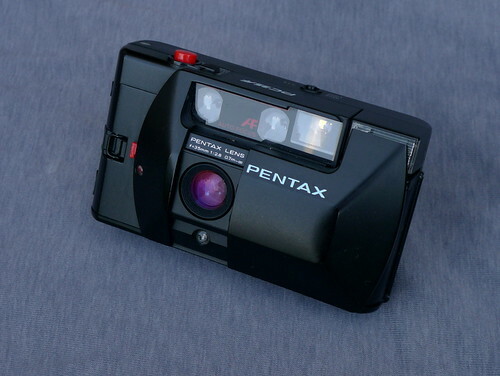 The Pentax PC35 AF was the first 35mm compact camera with autofocus from Pentax released in about 1982. 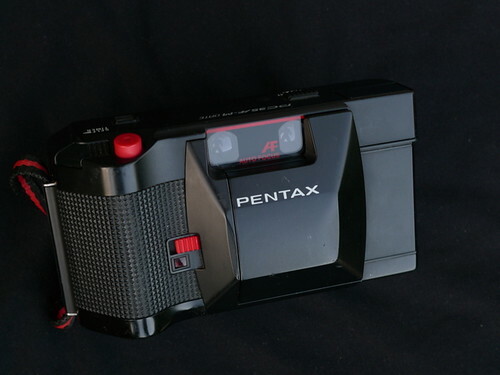 Its name led to a whole range of Pentax PC cameras. 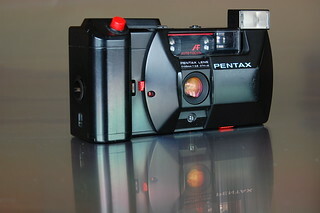 A Pentax PC35 AF Date version is also available. Early examples are made in Japan, later production was moved to Hong Kong. 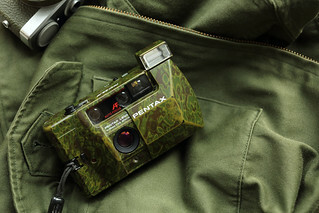 It is available in black, and green camouflage. 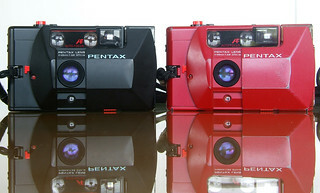 They were also sold bundled with the PC35 Winder film advance motor accessory in silver, red and black. 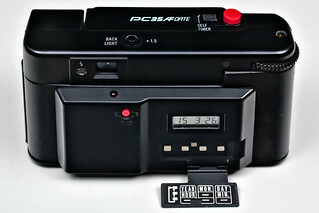 There are later versions in 1984 with power-winding (PC35 AF-M), a date function (PC35 AF-M Date) and special edition model in 1985 (PC35 AF-M SE). The 35mm f/2.8 lens is protected by a sliding cover that can be released by pressing down on a small tab on the right side of the cover. The lens is able to focus from 0.7m to infinity. To focus aim the circle in the viewfinder to the subject and half press on the shutter release. The bottom of the viewfinder frame displays the approx focusing distance with pictures of single guy 0.7m, couple 1.5m and mountain infinity. A needle points to the distance. The top of the finder frame has a green indicator for correct exposure. If orange, an audible beep is heard so light is insufficient and flash may need to be used. The flash can pop up by releasing the switch on the base of the camera. A led on the left of the finder eyelet will be green when the flash is charged. A exposure compensation button is on top of the camera, it changes the exposure by +1.5EV. The camera can use film from 25-400 ASA/ISO. There is no DX reading and film speed is set on the base of the camera with a sliding switch below the lens. The ASA/ISO stops are 25, 32, 40, 50, 64, 80, 100, 125, 160, 200, 250, 320, and 400. The film is advanced with a thumb wheel. The exposure counters numbers are in white, but the numbers 0, 20, 24, 26 are in orange. Rewinding the film requires releasing the film tension with a button and flipping up the metal film rewind crank on the base. The PC35AF winder accessory offers motorized film advance and a better grip. It needs to be switched on independently of the camera and requires its own batteries. A coin can be used to attach the winder to the body. Once installed, the film advance thumb wheel of the body is covered. This cover can be slide open and the thumb wheel can be used when initially loading film. Close the film back, slide close the cover of the wheel and power on the winder to automatically advance the film to the first frame. If the winder is powered off, but the camera is on, the shutter release will still function. When the cover of the tumbwheel is open, the winder will not advance the film even when powered on. The winder can only advance film, it cannot be used to rewind. Lens: Pentax 35mm, f/2.8 (5 elements in 5 groups). Infrared active triangular autofocus with pre-focus. Programmed auto-exposure from EV6 (f/2.8 at 1/8s) to EV17 (f/16 at 1/430s). Mechanical shutter with slow shutter warning LED and beep. Albada viewfinder with 85% coverage, auto-focus frame, picture frame, parallax correction frame, distance indicator needle, zone focus markers, lamps. No DX sensor and it is set manually from 25-400 ISO. Built-in flash. Flash guide number 11m at ISO 100, 6 second recycling. Power source: 2 x AAA batteries. Automatic film speed setting (DX coded) 25-1600 ISO in 1/3rd steps. Manual ISO setting for non DX film on bottom of the camera in steps 100-200-400-1000 ISO. 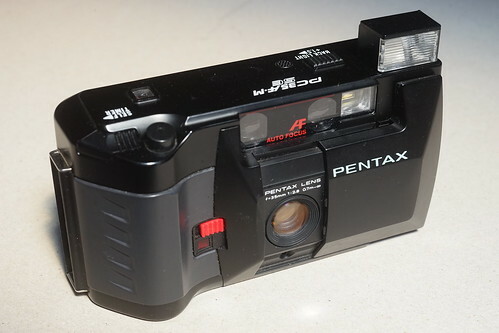 Pentax PC35 AF-M SE "Special Edition"
Same as the above, but the SE (Special Edition) model lacks the manual ISO setting on the bottom. The name "Special Edition" is probably nothing more than announcing the last model of the PC35 series. The SE has a different rubber hand grip and a black shutter button instead of the typical red one.